If you are a serious horseplayer and you have not been looking forward to the Saratoga and Del Mar meets for what seems like forever, it might be time to check your pulse. Saratoga and Del Mar are the summer places to be for all horseplayers and horse racing fans alike. For handicappers, the Del Mar and Saratoga meets provide nearly non-stop action, and it’s easy to see why horseplayers circle these annual centerpieces on their summertime racing calendars weeks or even months in advance. The summer racing seasons at Del Mar and Saratoga are all about the top horses, trainers and jockeys in horseracing and the top-notch handicapping and betting opportunities that go along with them. The fields will be huge, the competition will be stiff and evenly-matched and the payoffs will often be pricey and loaded with good value for horseplayers who are willing to put in the necessary effort. Del Mar will begin its 2017 summer meet on Wednesday, July 19, and Saratoga is ready to kick-off its 2017 meet on Friday, July 21. Both meets will run the remainder of the summer up through Labor Day, Sept. 4. Del Mar and Saratoga are the ideal meets for horseplayers who follow track trends and do their homework, because you know that many novice handicappers and tourists will be pumping money into the pools. There is particular interest in Del Mar this year for several reasons, including the fact that the track will be hosting its first-ever Breeders’ Cup later this fall. The track is also expected to be the summer home of reigning Horse of the Year ARROGATE. If all goes as planned, Arrogate may be making all three of his remaining starts this year at Del Mar, starting with a prep in the Grade 2 San Diego Handicap on July 22, then in the Grade1 $1 million Pacific Classic on Aug. 19,and then in the Breeders’ Cup Classic this fall. Del Mar’s stakes program will take on added significance this year with the track hosting the Breeders’ Cup. Overall, Del Mar will host 33 stakes, including 21 Graded stakes with six Grade 1s at the summer meet. 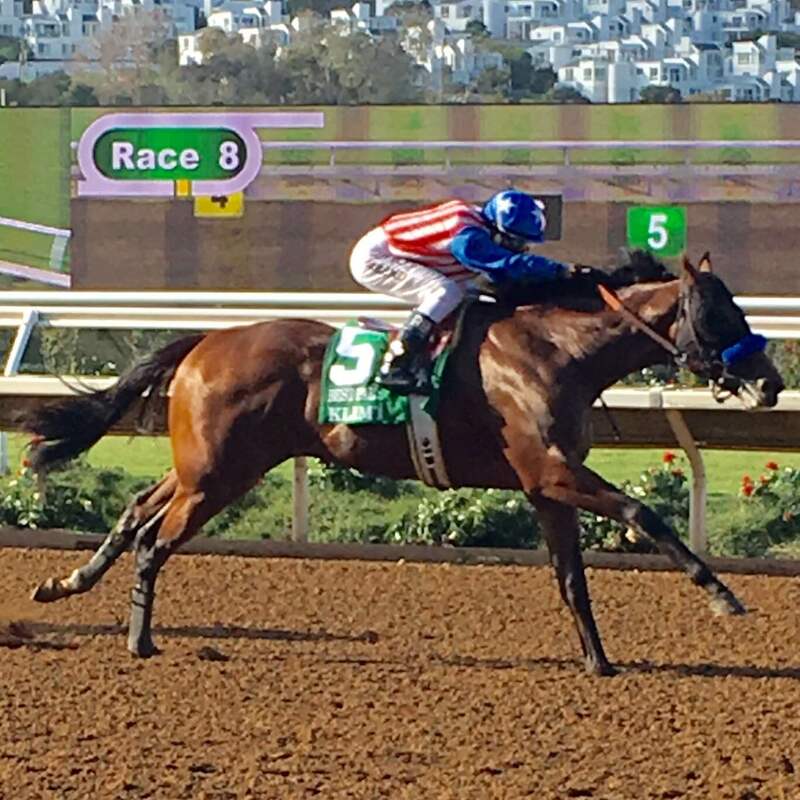 Five races will be Breeders’ Cup “Win and You’re In” races, with the Bing Crosby on July 29 (Sprint), the Clement Hirsch on July 30 (Distaff) and the Pat O’Brien (Dirt Mile) and the Del Mar Handicap (Turf) on Aug. 26 joining the Pacific Classic as featured events. Of course, these meets, or any meet for that matter, can sure be made even a lot more enjoyable when you are winning. Therefore, let’s take a look at a few short and simple handicapping tips that can get you started in the right direction and give you an information edge as you get ready to unleash your bankroll this summer. Read on for some advice on what to look for when betting at “The Spa” and “Where the Turf Meets the Surf.” Hopefully it can help you to enjoy profitable meets at Del Mar and Saratoga. Today, I’ll discuss Del Mar and tomorrow I’ll tackle Saratoga. Klimt draws clear from Big League in the stretch of the Best Pal Stakes at Del Mar last year (photo by Margaret Ransom). It’s summer in Southern California and, for horseplayers, that can only mean one thing: Del Mar. For handicappers, Del Mar will be a welcome change from the small fields, limited race days, and sparse betting opportunities offered at the recently concluded June portion of the Santa Anita meet followed by Los Alamitos. After eight years racing on a synthetic surface, Del Mar hosts its third straight year of dirt racing for track’s 78th summer racing season. Del Mar’s main track is certainly back to favoring speed a lot more now that it is dirt than it did back in the Polytrack days, when speed had difficulty holding up. However, while the slight preference on the Del Mar main track goes to speed, the track overall has played fair, and the front-end preference could not at all be termed a “bias”. In fact, most other race tracks, including the others on the SoCal circuit, favor speed much more so than Del Mar. The big news horseplayers will want to keep an eye on at Del Mar at the 2017 meet is the fact that alterations have been made to the main track under the supervision of track maintenance expert Dennis Moore. Del Mar has made alterations to the track’s banking and grading to make it nearly identical to Santa Anita, and the main track has also been re-surfaced with the same El Segundo sand used in Santa Anita’s main track. Handicappers will have to watch the main track carefully to take note if the track continues to play like the last couple Del Mar meets or if it starts to play more like the races run at Santa Anita. At the most commonly run distance of six furlongs on dirt, Del Mar will favor horses with tactical speed, capable of leading, pressing or stalking, but certainly not as much as at Santa Anita. Effectively, this means that come-from-behind horses will have better chances at Del Mar than at the previous Santa Anita meet. At six furlongs, horses definitely want to race within three lengths of the pace at the first call because the majority of these races are won by horses that are that close to the pace. Wait and see if Del Mar’s new main track surface starts helping frontrunners and pressers even more. If you want to bet against frontrunners in Del Mar main track sprints, it is much better to do so at the distances of 6 ½ and seven furlongs. At Del Mar, frontrunners at these distances still do well, but the big difference here is relative to Santa Anita, where front-runners do much better, comparatively, than at Del Mar. In other words, frontrunning or pressing winners at Santa Anita often lose at Del Mar, while stalking or closing losers from Santa Anita often start to win. So, this gives us our first betting angle at Del Mar: Downgrade front-runners who won at Santa Anita at 6 ½-7 furlongs and upgrade horses coming from Santa Anita with some tactical speed that came up a little short. Watch this factor and see if it has changed at all due to Del Mar’s recent track work. Del Mar’s new turf course already has three years under its belt and is no longer a total unknown. Del Mar cards some of the country’s best turf racing of the summer. Since the new turf course was installed, Del Mar turf races are now carded for up to a maximum of 14 runners. With more horses in the turf races, the increased field sizes have had an effect on the importance of drawing a good post position. This is particularly true in turf routes longer than 1 1/16 miles, in which no horse won any race at any distance from outside post 8 in 2014 (summer and fall meets combined). In 2015, the outside posts remained a disadvantage with only a combined total of 12 horses winning from outside post 8 (including sprints), and in 2016, when just 16 horses won from outside post 8 (including sprints). At the most commonly run turf route distance of one mile, it is also worth noting the surprising post position revelation that the inside two posts, posts 1-2, do not have favorable stats and therefore do not provide any advantage. This is contrary to what a lot of people would falsely assume about the greatest post advantage at that one-mile distance, and anytime you have something contrary to what most people believe, it is usually something well worth considering in your wagering strategy. Therefore, in terms of post draws in turf routes overall, the best positions for bettors to focus on are posts 3-8. This is particularly true at one mile and 1 1/8 miles. In terms of running style preferences in turf routes, turf closers tend to do much better at Del Mar than at Santa Anita and should therefore be upgraded. Also, the pace pressers and stalkers in these races — those not on the lead but within four lengths of the pacesetter — do the best, accounting for roughly 50 percent of the turf route victories. Turf sprints have been unpredictable in the three years of Del Mar’s new turf course, shifting from year-to-year in terms of favoring early speedsters or closers, or inside posts versus middle or outside posts. Keep an eye on this as the 2017 season progresses. Meanwhile, one thing does seem certain: Santa Anita turf sprint form (from the 6 ½-furlong downhill turf course) does not translate well to Del Mar. Various kinds of horses win these very different five-furlong races at Del Mar, so expect a lot of form reversals — both good and bad — from horses’ recent turf sprints at Santa Anita. Also upgrade speed, which has a much better chance to hold on in Del Mar’s shorter turf sprints as opposed to at Santa Anita.